A building of strength or magnificence (Isa. ii. 15; Cant. iv. 4, vii. 4), and, with a more limited connotation, a watch-tower in a garden or vineyard or in a fortification. It was customary to erect watch-towers in the vineyards for the guards (Isa. v. 2), and such round and tapering structures may still be seen in the vineyards of Judea. Similar towers were built for the protection of the flocks by the shepherd, in the enclosures in which the animals were placed for the night (comp. the term "tower of the flock," Gen. xxxv. 21; Micah iv. 8), and it is expressly stated that Uzziah built such structures in the desert for his enormous herds (II Chron. xxvi. 10). Around these towers dwellings for shepherds and peasants doubtless developed gradually, thus often forming the nuclei of permanent settlements. Towers for defense were erected chiefly on the walls of fortified cities, the walls themselves being strengthened by bastions (Neh. iii. 1), and the angles and gates being likewise protected by strong towers (II Kings ix. 17). 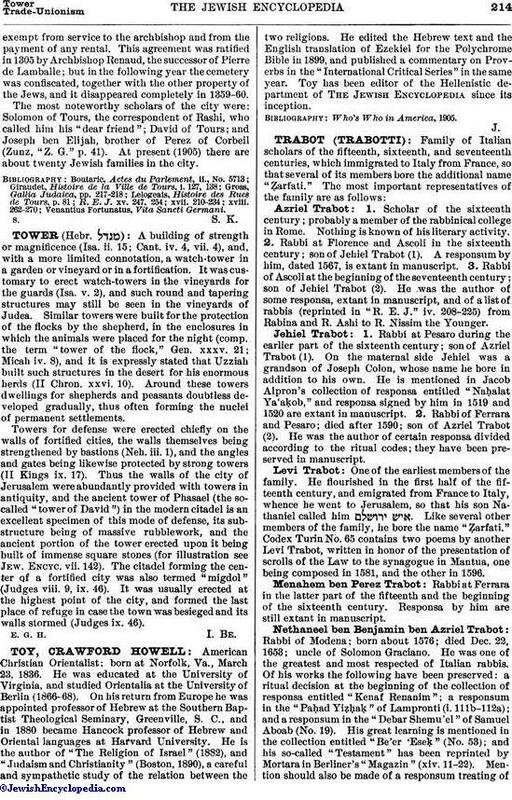 Thus the walls of the city of Jerusalem were abundantly provided with towers in antiquity, and the ancient tower of Phasael (the so-called "tower of David") in the modern citadel is an excellent specimen of this mode of defense, its substructure being of massive rubblework, and the ancient portion of the tower erected upon it being built of immense square stones (for illustration see Jew. Encyc. vii. 142). The citadel forming the center of a fortified city was also termed "migdol" (Judges viii. 9, ix. 46). It was usually erected at the highest point of the city, and formed the last place of refuge in case the town was besieged and its walls stormed (Judges ix. 46).